We rolled our second Sunday special session last week. This time, I arrived for the 10 a.m. start slightly sleepy-eyed after working the closing shift at my new job. My practice rolling at Bowling Green in North Syracuse did not go well, as I felt like an old man pleading with his joints to loosen up even an inch. Or maybe even like the Tin Man searching for that can of oil. Creaky! But then the live action started in our 12-team Thursday Night Men’s League, and I threw a strike in the first frame. Another hot Sunday for our squad. 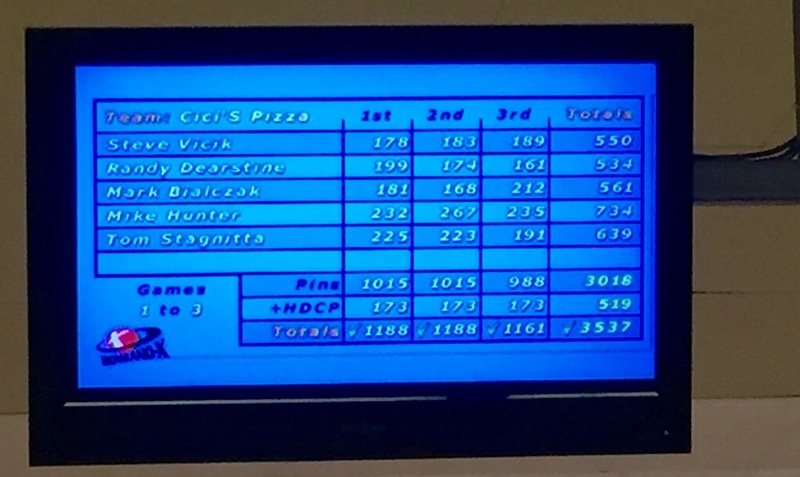 In the 10th frame of game three, I went strike-strike-nine to close out my 181-168-212 for a 561 series. I felt smooth, warm, energized. Now my official bowling sockware. Maybe it is those lucky socks I remembered to wear again. With red-hot Mike Hunter subbing for Tiny, who was hunting with his pals, we swept, taking all seven points. Mike is a scratch bowler. That means he carries a high average, well above 200. He’s subbed for us in season’s past. Tom picked well. With two weeks left in the first half of the season, we’ve got a chance to finish pretty high. Knock on wood. Have you ever felt stiff and uncoordinated and all of sudden have everything physically click into place, and if so, what was the occasion and why do you think that happened? Have you ever invited a replacement who produced very well, and if so, what was the occasion? What’s your suggestion for me to turn my Thursday night rolling into Sunday-style high scores? To mix my metaphors as well as my team games bro Mark, that would have been 3 strikes, you’re out in my case, because hitting the gutter 3 times in a row doesn’t count if memory serves me correctly. So how is your day this Sunday morning? Mine is good, gray and cloudy. Inside the color is bright and cheerful though, and the crafting goes on day and night. Christmas is coming, the goose looks more like a rooster or an owl, God’s In His heaven and all’s right with my world. The rest of the world seems to be going to h**l in a handbasket, but as long as I keep my door locked maybe it will keep the rest of them away. Or at least keep the dream alive inside for me. Have a good week little brother. It’s gray and I think cold here, sis Angie, because the furnace is running steadily as I read comments and get set to write a few days’ worth of blogs before working a Sunday shift that starts at 1:30 p.m. Life is something, indeed, quiet at this moment. Normally, bowling is the last thing I get to enjoy on my weekend before going back to work immediately after my Friday night league… but having to work Black Thursday changed things up for me this week. Heck, maybe it made me a bit looser since I wasn’t sitting around for two days. I shot a 507 despite not hitting my 173 average in any game….. hard to do! 3 out of 7 will just barely keep us in first going into next week. 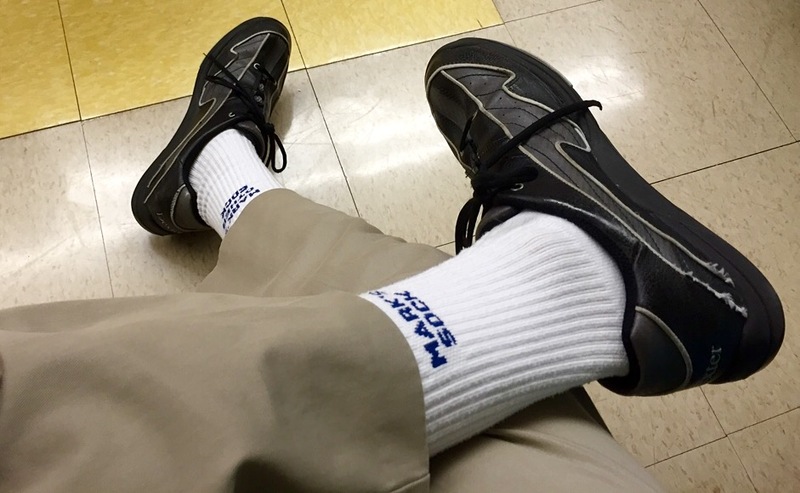 Forget the socks, I’d keep that 734 series bowler around for good luck!!! Yes, it was the hot sub that lifted us all up by osmosis, Bill. I agree. You did great despite not hitting your 173. You must have been loose from that customer-filled day. I’m glad your Black Thursday at Mecca is over for another year, my friend, now that I’m immersed in retail with you to relate completely after my first non-stop Black Friday! Yes, I added big box store job serving the public up front, 25 hours per week at the end of October. I had the 7 a.m. to 4 p.m. BF shift at the register. Non-stop customers. Interesting, for sure. I think everyone should have to work one at some point in their life… not just to get an appreciation for what life’s like on the other side, but because it really is a fascinating people watching experience. Manning a register is something I’ve never had to do in all of my many, many years… let alone have to do it on Black Friday! My hat is off to you on that one! You got that right, Bill. People are interesting, and the good far, far outnumber the other end. (Knock on wood). Thanks, my friend. Thanks, PJ. I’ll see if I can extend the good rolling this Thursday, and if the team go two more weeks for a great first half of the season! My answer to the first part of your first question, Mark: Yes. Woo-Hoo love the socks Terp! Have a good day my friend! Gatorette. Thanks I hope you have a good day too! They are now official bowling attire, Beth. As long as my brain kicks in every Thursday and doesn’t fall to creaky, uncoordinated movements, that is! Sounds like your lucky socks and a bit of a warm up did the trick! Yeah, sometimes with dancing nothing works right, my body just bonks out. Then other times, especially when dancing with a corps, everything falls into place as an individual and as part of the corps. It is like an out of body experience moving as one unit. Feets don’t fail me now, Scott.